Real food is raw. 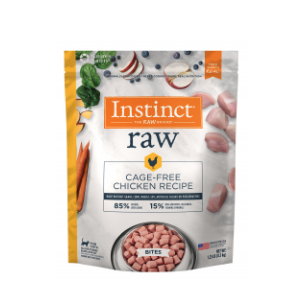 Each Instinct® Raw recipe is protein packed with 85% meat and organs and 15% non-GMO fruits, vegetables; vitamins & minerals. We use whole-food ingredients like cage-free chicken and never include grain, corn, wheat, soy, artificial colors or preservatives. We believe in the power of raw nutrition because we know the good it can do. Unlock your cat's potential to thrive with Instinct® Raw.